Posh boss Grant McCann wants Shaquile Coulthirst to shoot more often. Peterborough United tackle one of the country’s most in-form teams at the ABAX Stadium tonight (November 22, 7.45pm kick off). League One leaders Scunthorpe are six points clear at the top of League One this season having ended the last campaign in terrific style. In their last 38 League One matches, Scunny have won 24 and lost just four with most of their success arriving following the appointment of Graham Alexander as manager last March. Posh striker Tom Nichols has been told to be a bit greedier in front of goal. Posh boss Grant McCann has great admiration and respect for the achievements of one of his former clubs, but he insists his players are capable of inflicting just a third League One defeat of the current season on tonight’s visitors. “Scunthorpe have been outstanding this season,” McCann stated. “And don’t forget they only just missed out on the play-offs last season after finishing with a flourish. “They have a good blend of youth and experience and a very good manager. They must be full of self-belief right now, but then so are we. They have a dangerous player in great form like Josh Morris, but we also have plenty of quality players also in good form. “This is a game we are really looking forward to as we can make another statement of intent. We are playing well, we are in a good run of form and we have a great spirit throughout the whole squad, which is very important. Posh boss Grant McCann in his playing days for Scunthorpe. “We can give anyone a game in League One and one thing’s for sure Scunthorpe will know they’ve been in a game tonight. “There has been a bit of a phobia about playing Tuesday nights for us in the last couple of seasons, but that’s not the case now. “The lads are fit. They can cope with playing Saturday, Tuesday, Saturday and they like playing under the lights at the ABAX. Ex-striker Dwight Gayle scores for Posh at Leeds United in 2013. “Adkins was an excellent manager for me and I am using some of his methods at Posh. “But all that means nothing tonight. It’s a game I want to win badly and I believe we can. “The fans can help as well. The atmosphere can be excellent at the ABAX at night matches. The fans also made a difference at Northampton on Saturday. “We want to keep building our support and the only way to do that is to keep winning. McCann confirmed yesterday’s (November 21) Peterborough Telegraph story about interest in prolific Dover Athletic striker Ricky Miller, but he believes his current front two Shaq Coulthirst and Tom Nichols are performing well for the team. McCann wants them to be a bit greedier so he’s been showing them clips of the top two Posh strikers of recent times. “I’ve shown Tom and Shaq clips of Britt Assombalonga and Dwight Gayle when they were at the club,” McCann added. “It’s noticeable they never used to worry about passing when a shot was on and that’s something Tom and Shaq can copy. “But the pair of them are working hard for the team. I’ve been pleased with them. The work they put in helps us get up the pitch as a team. 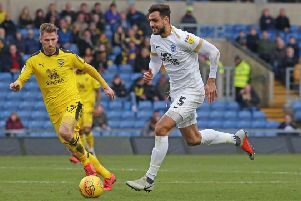 Posh picked up a few bruises in Saturday’s win at Northampton and central defender Ryan Tafazolli has a cut head, but McCann has a full squad to pick from apart from long-term injury victim Jermaine Anderson.